Posted in Uncategorized	| Comments Off on As we head into Summer….. The PTSA, with Lora Bunch coordinating the effort, puts on a week of treats and meals for our 85+ members of Madison Staff. Want to help out? Email Lora to see where you can help or simply donate money for a Starbucks gift card! Wednesday, June 6th ( in June due to May testing)- Staff Luncheon Day in the Commons (serving starts at 2:30) We will do this on a Seattle Schools early release day so that staff can have a nice relaxing lunch together. 4/18/2018 – Thanks to everyone who came out to our Annual Silent Auction & Swing Dance benefiting the music students of Madison. We were joined by a record number of parents, students, former students and folks from the community for an evening of dancing and live jazz by the professional musicians of the West Seattle Big Band, and the various student band and orchestra groups within Madison. Guests bid on silent auction items, enjoyed a slice of pizza, and raised their paddles for a record-breaking $23k in net profit donations. We’re thrilled to have had this opportunity to raise the much needed funds for the Madison Music Program, and we look forward to seeing you all at next year’s Auction & Swing Dance! 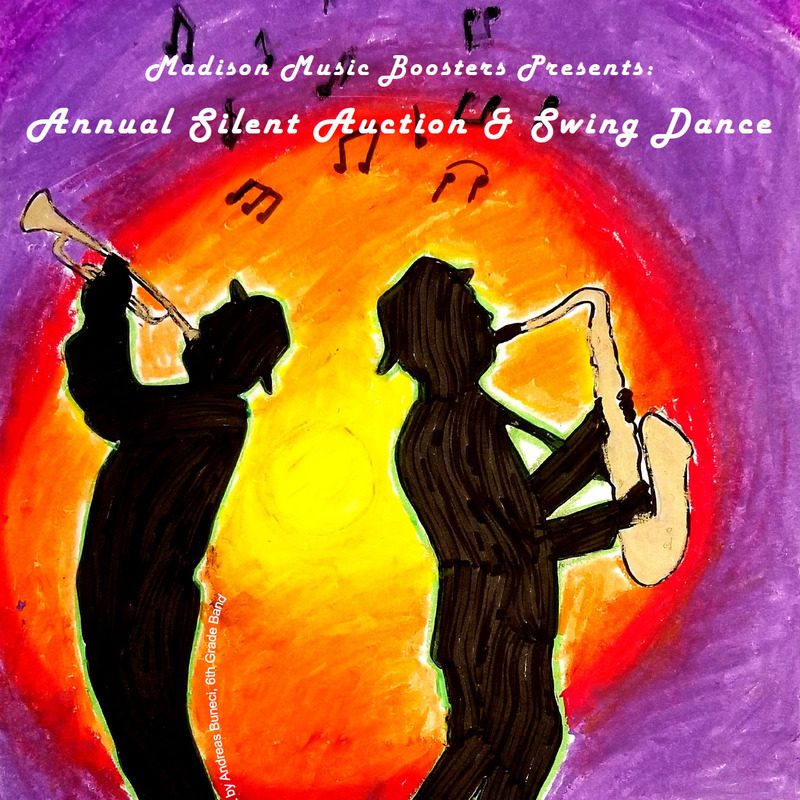 Join us on Friday, March 30th at 6:30pm for the annual Madison Middle School Music Boosters Silent Auction & Swing Dance Fundraiser! Come dance the night away to the lively sounds of the West Seattle Big Band, our special guest for the night. And enjoy live performances from the students of the Senior Orchestra, Senior Band and Jazz Band throughout the night. Please join us for our PTSA General Meeting on Wednesday, March 21st at 7 pm. We will be reviewing the fundraiser results, Spring grants, discussing gun safety advocacy, and looking ahead to next year. Dr. Gary will speak to parents about what safety measures have been taken at Madison and Seattle Schools, and address parent questions and concerns. All parents are welcome and encouraged to attend. The PTSA Board will meet at 6:30 pm, just prior to the General Meeting, rescheduled from earlier in the month.